The second chapter of Peter Jackson’s return to Middle Earth, The Hobbit: The Desolation of Smaug accelerates from the first minute of the film and never looks back, speedily moving our heroes and their villains to the cusp of the grand climax. Those who felt that An Unexpected Journey, the first installment, hewed too closely to the feel and structure of the Lord of the Rings adaptations are in luck, as Desolation of Smaug offers many more new sights and characters distinct from that of the earlier films. The locations of Beorn’s cottage, Mirkwood, and Lake Town are especially full of fantastical imagery, and while there are references to Lord of the Rings, the details of these locations solidify The Hobbit films as works of fairytale, as opposed to fantasy epic. Populating these locations are Beorn (Mikael Persbrandt), a giant-size bear of a man, Tauriel (Evangeline Lilly), a wood-elf created for the film, and Bard the Bowman (Luke Evans), the would be rabble-rouser of the water-laden town. There’s a certain kind of person required to play a Tolkien elf, and Lilly fits the bill, giving us a slightly more accessible version of Legolas (Orlando Bloom). She retains the aloofness that is trademark to all Elves, but adds a more urgent personality. Lee Pace is also given the opportunity to expand his role as Thrandiul, the Wood Elf King (and Legolas’ father), adding questionable trustworthyness to someone we assume will be an ally. The centerpiece of the film by far is Smaug the dragon (Benedict Cumberbatch). A masterfully rendered CGI creature, it’s hard not to just be in awe of the character, especially on a large screen. For all of the hype leading into Star Trek Into Darkness of Cumberbatch’s turn as Khan (surprise! ), this is where he really delivers. Smaug may covet gold, but he boasts a silver tongue. Full of refined charm with a raw menace underlying his every word, Smaug doesn’t come off as evil so much as completely selfish. Cumberbatch’s voice is perfectly matched to Jackon’s interpretation of the Magnificent Dragon. 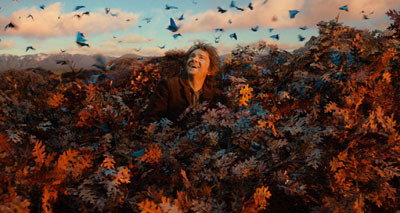 His dealings with Bilbo (Martin Freeman) are a joy to watch, and despite the rapid pace of the film, it still feels like it takes too long for the title characters to face off. The Hobbit films are much more action-oriented than the more epically-minded LOTR films, so it is fitting that the second-best thing in the film is a scene in which Bilbo and the dwarves escape their foes by riding down a river in oversized barrels. It’s a wonder to behold, a joyous expression of motion and action committed to the screen. Just watching it is akin to a theme park ride, and is one of the best action sequences of the year. However, the film grinds almost to a halt after that sequence, and while a breather is appreciated, we have a little too much downtime before moving onto the main event. Pacing continues to be a problem with The Hobbit, as these films feel somewhat overstuffed. While the first film was too front heavy with background exposition, this film packs in four or five interconnected storylines that are constantly moving toward a resolution we don’t get. The film is all rising action, and is not structured to give us any sort of satisfaction. That isn’t categorically a negative, but the film’s ‘cliffhanger’ feels more like a pause than an ending or turning point of the story. While devout fans of the book will find a lot of the additional plotlines unnecessary or unwelcome, it is an interesting direction to take. I didn’t find any of the additions or changes blasphemous, and they do a lot to fill in the blanks about the buildup to the War of the Ring. For those concerned about these films’ similarity to Lord of the Rings, it’s easy to forget that both stories have the same general structure. I don’t think Jackson goes too far out of his way to connect the films to the previous trilogy, and I imagine for casual fans and non-readers, it probably clarifies a lot of what the stakes are for Bilbo and Gandalf. The less polished, more whimsical tone of these films is fitting for the source material, but walking the line between that and viewer’s LOTR-based expectations is something not to be taken lightly. The Hobbit: The Desolation of Smaug provides some key memorable scenes that were lacking in the first film, but doesn’t quite reach previous Middle Earth efforts. It also suffers a lot from being a middle chapter, so the final verdict remains to be seen. I am not sure how many Hobbit-haters this film will convert, but it provides such visual spectacle that it’s worth seeking out theatrically. Note: I saw Desolation of Smaug in the much reviled High Frame Rate (HFR) of 48 frames per second (fps), on an IMAX screen, in 3D. While the faster speed adds great dimension to some of the fantastical creatures in Middle Earth (Smaug looks especially stunning), I was less impressed with the overall look of the effect this time around. After the first 10 minutes or so of the first film, I stopped noticing, but this motion-heavy installment had too many moments that reminded me that what I was watching was ‘different.’ This may also stem from the combination of HFR and IMAX, as this is the first film to screen in the format, and I am not sure they have figured out how to make it look good. So unless you were a fan of HFR before, I would skip it. The 3D, however, is astounding, and worth the upgrade to see Smaug in all his splendor. 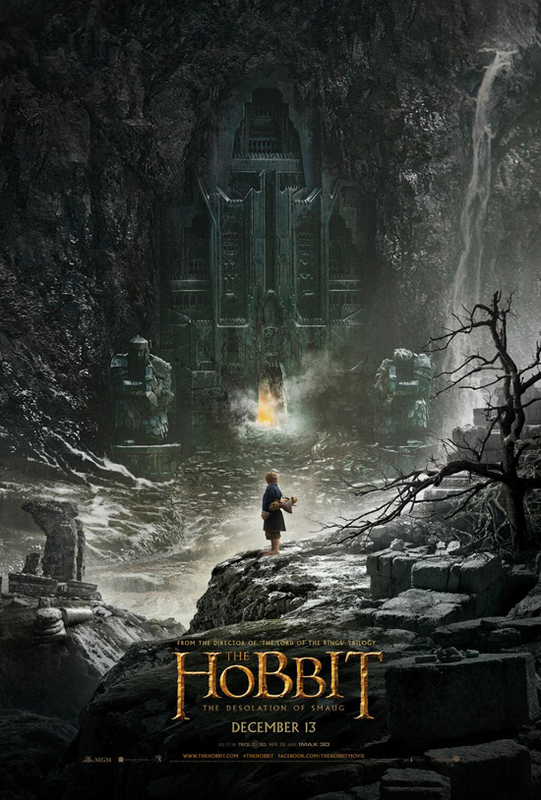 The Hobbit: The Desolation of Smaug opens today in Philly area theaters. Actually the 1st HOBBIT was also 3-D HFR IMAX at KOP last year. I nay be in the minority, but I actually liked it a lot.